Despite being hit by a car that caused injuries so severe that he is now confined to a wheelchair and unable to speak, Tim Maguire is banging out the tunes after he and his close friends found a way to get him on the decks and DJing. Tim suffered critical injuries after the accident in Northampton thirteen years ago. While he can’t speak, he can communicate by using a brain / computer interface and despite having aspects of his mobility severely limited, he has always wanted to be a DJ. With a steely determination, he completed a BTEC diploma in music with merit in 2009, and having made his way through the academic, he was bursting to take things straight on to the dancefloor. 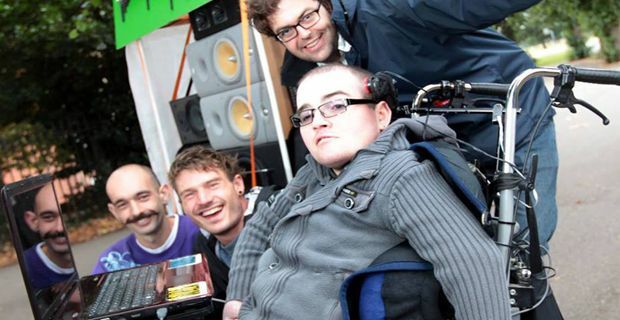 His mate, Pete Cooper designed him a computer program that would allow him to operate the DJ controls on his laptop using two head switches attached to his wheelchair, while Mark Jones, Elliott Johnson and Oliver Handley designed a mobile set of decks out of scrap metal and recycled bits and pieces. Step forward The E Z Roller 12v mobile sound system. “Ever since I was young I wanted to be a DJ but after my accident I never thought this would be possible. Life was really tough and I didn’t really see a point in living. Gwannnn the EZ Rollers, let's av ya!